Visit the global Energy archives for posts from all DGR sites. Puna Pono Alliance (PPA) just sent a newsletter, reposted below, calling for immediate community support and testimony on two issues this week. Please share this information, and testify in person or submit testimony by noon of the day prior to each meeting. Even if you read this too late to testify, it’s worth reading to stay up to date on what’s going on. Bill 77 would take the money we fought for to help relocate people impacted by geothermal and instead use it for typical political purposes at the impacted residents expense. IMO this is another shameless attempt to take the few crumbs given to the community forced to live with these toxic power plants for political gain by Council member Illigan. From PPA’s perspective, the problem with Bill 77 is that it further dilutes the fund, the primary purpose of which is (or should be) the relocation of residents adversely impacted by proximity to PGV. What Bill 77 does is add “staff expenses related to the program, including salaries for staff or contractors, and related fringe benefits.” Thus, the funds could be used to pay anyone for any “public purpose” expenditure in Lower Puna. Unfortunately, this has turned this into a political “slush fund,” particularly after the Planning Director suspended its use for its initial intended purpose. Instead please tell the council to restore the geothermal relocation fund to its original purpose of helping the people forced to live with these dangerous industrial developments. In January 2015, the Planning Department suspended purchase of homes using funds from the geothermal relocation and community benefits fund. The reason for suspension of the program was uncertainty about lava flow then in progress. Some scenarios would have prevented operation of PGV and would have resulted in no further geothermal royalties. The county bought five homes late last year, the first purchases since the program was flooded with applications in 2012. The Geothermal Royalty Fund had $2.7 million as of Jan. 8, with another $1 million in reserve. That would be enough funding to continue with purchases of homes, but not enough for all remaining 30 homes requested. PPA Position: Since the program is insufficiently funded, no funds should be taken from the geothermal relocation and community benefits fund until a formal review of the program is completed and new direction is developed. PPA Position: Under no circumstances should the fund be used to supplement the county budget for required county functions. Rather the fund should be used for relocation and community benefits. As to benefits, the priority should be to provide benefits first to those most impacted by geothermal. Resolution 249-15 is also problematic and I never cease to be amazed by elected officials like Illigan who appear so cold and out of touch with the families that live near these plants. We agree that Hawaii County needs a resolution addressing geothermal energy. The county’s geothermal resource permit (GRP) is out of date and does not conform to Clean Air Act Title V permit requirements. The county resolution should be revised to strike the false statements and instead focus the Planning Director on re-doing the GRP, to include conformance with pertinent laws and regulations. Many believe centralized power sources on the grid, regardless of how the power is generated, are wrong headed. See Thomas Lee Travis testimony to the PUC regarding the NEXTERA acquisition of HECO companies. Therefore, the promise of geothermal energy is in doubt. On August 7, 2014 PGV had a serious release that made over one hundred people sick, knocked out over ten people, and may have contributed to the death of two people. It is expected that a major tort suit will result. As recently as 2012 PGV drilled without using best available control technology. Only because of pressure from the County did they do better in 2015. No new regulatory issues were involved beyond the threat that the County’s nighttime drilling ban might apply. The wording in the WHEREAS section must be modified to remove the errors. The wording of the recommendations should be modified to read as follows. The appropriate Hawai’i County Planning Commission should have the authority to regulate future geothermal development in Hawai’i County, particularly as concerns land use and zoning decisions. Development of geothermal resources should mitigate impacts to people by the use of best available control technology. Additional development of geothermal resources not approved by Geothermal Resource Permit 2 should not be built within three miles of zoned residential areas. Placement of a geothermal plant should be approved only after considering environmental, economic, community, cultural, and social issues. Finally, County Council members would be well advised to seek input from the affected community before offering documents such as these for consideration. This entry was posted in Mining & Drilling and tagged Bills & laws, Energy, Geothermal, Gregor Illigan, Puna Pono Alliance on August 16, 2015 by Norris Thomlinson. You can also contact Gov. David Ige, contact form or 808-586-0034, and Mayor Billy Kenoi, cohmayor@co.hawaii.hi.us or 808-961-8211. If you can, please attend the Council meeting in Hilo on Wednesday, February 4 to support the resolutions. And if you haven’t yet, please sign the petition against PGV night drilling. The State DOH has agreed to hold a public hearing for PGV’s Clean Air Permit renewal. The date and location have not been announced yet. We are asking them to hold that hearing in Puna. What you can do now is e-mail cab@doh.hawaii.gov and/or phone (808) 586-4200 (between 7:45 a.m. and 4:15 p.m) to thank them for having a public hearing and ask that it be held in Pahoa. Puna Pono Alliance (PPA) could use support this Thursday if you can make it. PGV will hold a public meeting to answer questions Thursday 1/29/15 at 7:00 pm at the Pahoa Community Center. It would help if we get a lot of people there. PPA has created a google group to help document noise and other impacts of the PGV drilling. To join, send an email to paul@punapono.com from the email address you want to use for the group. This group is for anyone who thinks they may have negative impacts (for example, noise, dust, vibrations, odors from the drilling or operations) or from anyone who wants to support efforts to encourage the State and County to regulate industrial corporations in residential areas. This entry was posted in Lobbying and tagged Bills & laws, Energy, Geothermal, Gregor Illigan, Human health on January 28, 2015 by Norris Thomlinson. Puna Pono Alliance has launched a petition asking the governor of the state and the mayor of the county to enforce the night-time drilling ban against PGV. We, the people, haven’t had much success so far with asking those in power to do the right thing. But please take a moment to sign this while keeping in mind that more serious resistance may be necessary. This entry was posted in Lobbying and tagged Geothermal, Puna Pono Alliance on January 25, 2015 by Norris Thomlinson. When: January 19, @ 6:30pm. Where: Pahoa High School Cafeteria. PGV has joined forces with Puna Council reps Greggor Illigan and Danny Paleka to actively campaign against the night time drilling ban we enacted to protect our community from PGV’s previous impacts due to 20 years of poor drilling practices. Specifically, Paleka and Illigan support PGV’s stated intention to drill 24/7 in violation of the night time drilling ban. Several major accidents and missteps at the PGV power plant last year resulted in harm to our community again, and both DOH and EPA cited PGV last year for numerous violations of their permits. In discounting and essentially disregarding what this community has endured at the hands of PGV, both council members Illigan and Paleka have said publicly they support PGV intention to drill at night regardless of the law. That of course is in direct conflict with the communities best interest. These council reps are doing this with no legal experience to speak of and without even bothering to ask for a legal opinion from the Corporation Council. They instead are relying on a special interest (PGV) to interpret the law. This is an example of how bad government works to the detriment of the community, we should shine a light on this type of improper behavior by our our elected officials. In this case corporate interest have clearly been put ahead of the public interest by these 2 elected officials to benefit a special interest at expense of our community. I went to Danny’s office to talk to him about this and ask for a copy of corp council’s opinion, he told me he never talked to them. He then promised to do so promptly, but don’t hold your breath. We will probably have to do that as well. I also spoke with Council member Aaron Chung (an attorney), who told me he disagrees with Paleka, Illigan, and PGV. In fact he agrees with PPA and the community – the law applies to PGV as written. He based his opinion as do we on reading the law and the permit requirements that “PGV obey that law and all county laws. In my opinion it is dangerous and unfortunate that Illigan and Paleka appear to be playing fast and loose with the best interest of our Puna community to benefit a special interest (PGV). I see no valid reason for them to fight for PGV against the community on this law. It is a sad commentary on the state of our county government. Puna Pono Alliance needs your support now, this is our chance, let PGV know how you feel about the planned drilling now – before it starts. On January 19, next Monday, Puna Geothermal Venture is holding a community meeting. At that meeting they will be discussing upcoming drilling, currently scheduled from late January until March. During that drilling, PGV does not plan to comply with a county ordinance that requires drilling activity to stop between 7 PM and 7 AM. This intended action is an insult to the community and to those who must bear the personal cost of PGV actions. If you live close to PGV, we ask that you come to the meeting in a show of solidarity in which we say you must stop placing community families second. If you live elsewhere we ask that you show your support for our neighbors that are being sacrificed to corporate convenience. Thank you again for your past support in helping us defend our neighborhood from industrialization. We passed a law, now we need to let them know we intend to see the law enforced. As you may have heard, PGV is planning to begin drilling a new well on January 25 and they say they expect it to go on for 3 months. The last time they drilled a well, it went on for 5 1/2 months and it made life miserable for people near the plant. Despite a Hawaii County ordinance which bans nighttime drilling from 7 pm to 7 am, passed by the Hawaii County Council in response to PGV’s last drill , PGV says they will drill day and night because–they say–the ordinance does not apply to them. We need the help of those that live close to the plant because if we don’t step up, PGV will continue to drill day and night–and they drill new wells every few years. Paul Kuykendall and Suzanne Wakelin are working to document the noise and its impact on neighbors to force the county and state to address it as a health and quality of life issue. The good news is that we live in an age where we can capture data via crowd-sourcing that will build our case with some very cool, high tech tools. We are going to use NoiseTube to collect and collate data using mobile phones which we can later analyze and show on google maps to quantify the noise impact. 1. Email lists@punapono.com with your phone number and consent to receive email updates on this project. Please be prompt because we will only have 30 minutes. 3. If you can, please download the free app to your mobile phone by following the link below. It has instructions on how to download to an Iphone and an Android phone. If you do it before the training, we can show you how to use it. 4. Please share this email with friends and neighbors who could be negatively affected by the drilling noise. If you want to connect with PPA, please come to the 4 o’clock meeting this Tuesday at HAAS School. This entry was posted in Lobbying, Mining & Drilling and tagged Energy, Geothermal, Gregor Illigan, Puna Pono Alliance, 11: Civilization is a culture of occupation on January 18, 2015 by Norris Thomlinson. 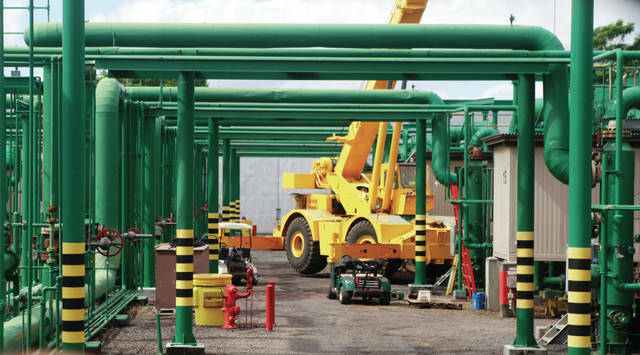 Puna Geothermal Venture (PGV), operator of the geothermal plant in lower Puna on Hawai’i island, plans to start drilling a new well as early as January 2015. The existing five wells have mysteriously dropped in electricity generation from 38 to 30 megawatts. The last well PGV drilled two years ago, at great expense to the sleep and health of neighbors, has never come online as it failed to find sufficient heat. In the past few years, the plant has released potentially deadly hydrogen sulfide on multiple occasions, with ongoing refusal by PGV or civil defense to put proper monitoring equipment and systems into place to protect nearby residents. Yet PGV wants to drill a new well, and is trotting out obfuscations, vague promises, and lies familiar to anyone who’s been following the fight over the years. PGV has promised effective noise mitigation measures for decades, but never delivered. The geothermal exploitation is also a direct violation of the religion of traditional Hawaiian Pele practitioners, who oppose drilling into and stealing energy from the goddess. We will report if plans unfold for direct action, so comment here if you’re interested, and subscribe to email updates in the sidebar to the right. This entry was posted in Mining & Drilling and tagged Energy, Geothermal on December 28, 2014 by Norris Thomlinson. Representatives Chris Lee and Cindy Evans along with their committees on Energy and Environmental Protection and Water and Land made appropriate changes to Senate Bill 2663 (now referred to as SB2663 SD2 HD2.) They not only cleaned up the Senate version of the bill, but they also provided for contested cases in geothermal permitting and a ban on fracking (with a sunset of 10 years.) Representative Sylvia Luke and her Finance committee then also approved the favorably amended legislation. Thank you for your concern and support for a community that lives near Hawai`i’s only geothermal development. We appreciate how the House has provided for contested cases in geothermal permitting and a ban on fracking as amendments to Senate Bill 2663. These House changes, along with other improvements in language and intent, make Senate Bill 2663 an initiative I support. As members of the House and Senate confer on the bill, I ask that you please keep contested cases and the ban on fracking as essential elements of the bill. Without both of these elements, I feel that the bill would not be worthwhile. This entry was posted in Lobbying and tagged Bills & laws, Fracking, Geothermal, Puna Pono Alliance on April 23, 2014 by Norris Thomlinson.